Baseball Prospectus was kind enough to run a meta-sabermetric history piece written by me on the history of replacement level in sabermetric analysis. As you can imagine, it's not a topic that has generated a lot of responses, but the one person who has commented on the article so far seems to like it, and perhaps you will too. * I always like to write a little something about playoff odds. The playoff odds that I publish are not intended to be the most accurate. They incorporate only full seasonal team data, haphazardly thrown into a weighted average. They assume that win probabilities are constant from game to game. There are other nits I could pick, but those are the huge ones. So why bother? The main goal is to once again make the point that attempting to predict playoff outcomes is largely a fool’s errand. This is probably an obvious point to anyone who reads this blog, but it is one that I feel compelled to come back to each October regardless. The methodology here was to use my crude team ratings--based on estimated win ratio and adjusted for strength of schedule. I figured three sets of these--based on actual wins and losses, based on runs scored and allowed, and based on runs created and allowed. Then I combined them and built-in some regression to the mean, with no real rhyme or reason to the weighting (the win ratios fed into the rating are based 30% on actual record, 30% on R/RA, 20% on RC/RCA, and 20% on .500). As you can see, the rating system still believes that the AL is superior to the NL (the overall AL rating is 106 versus 95 for the NL). Baltimore comes out better than I expected, and it is worth remembering that playing in the AL East means that their schedule was very tough (after the season, I’ll have a post with full rankings). You may be surprised to see Cincinnati so low, but they exceeded their expected W%s by a fair amount and along with St. Louis were the strongest teams in the weakest division, meaning they faced the easiest schedules in MLB. I would suggest that Oakland and Washington are the teams that benefit the most from the crude nature of this approach. No team has much better than a 1 in 3 chance of winning the pennant, which is typical but completely out of line with the mainstream notions of anointing favorites. 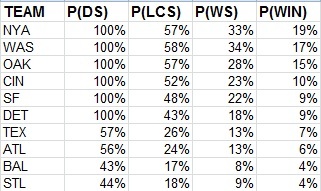 It should come as no surprise that the four wildcards rate as having the lowest odds, but it’s worth noting that the wildcards combined have a higher estimated probability of winning the World Series than the #3 seeds in each league. Collapse aside, Texas remains one of the strongest teams on paper. Atlanta compares favorably to Cincinnati or San Francisco, and both Baltimore and St. Louis have respectable chances (in fact, the Cards 8% is better than their 7% from a similar methodology last year). * The 2-3 Division Series format is already being set up as a ready-made excuse for any of the higher seeded teams that lose. I’m not saying it’s the optimal format, but the importance of having the first two games at home can be overstated. Of course, the model I’m using here can’t account for any psychological effects, but there is no difference in the expected outcome of the series as long there are three home games scheduled. Theoretically, assuming evenly matched teams in each game of a series, 37.5% of five-game series should go the distance and only 25% should be sweeps. But empirically, 41 five-game series since 1969 have been sweeps, while only 27 have gone the distance. Of course, those empirical results include teams that benefitted from jumping up 2-0 at home. While the 2-3 format is not ideal, and offers the possibility of what I call a reverse home field advantage (the lower seeded team actually playing more home games), I don’t see any reason to accept it as an excuse. A couple of the higher seeded teams will probably lose, but that happens in typical seasons as well. It’s also worth noting that a 2-3 format has been used before, most recently in 1995-96. In those two seasons, the cross-divisional matchups were pre-determined. In 1995 for example, the 100-44 Indians opened against the 86-58 Red Sox with two games at Jacobs Field and the final three games schedule for Fenway Park (Cleveland swept). Meanwhile, the 79-66 Mariners played the 79-65 Yankees. The 2-3 of 2012 may be a mild annoyance, but playoff formats have previously reached colossal levels of stupidity to which it can only aspire. * For the last few years I have also expressed my playoff rooting preferences. There’s no reason why you should care, but it’s good to get it off my chest. So expect a BAL/SF World Series (1.8% chance based on the crude odds). I have considered myself a baseball fan first and a fan of any particular team for over a decade. I can’t pinpoint the exact moment at which this happened, but it’s been a while. I never regret this; college sports offer me plenty of opportunity for simple good v. evil, one team only fanaticism. I consider professional baseball too entertaining of a sport, one too amenable to rational analysis, to tie up much of my interest in a partisan stupor. Still, I am a fan of the Indians, and I assume I will be until they move to Albuquerque in 2037. And so on Thursday evening, as I learned about Manny Acta’s firing, I vented a little bit on Twitter. The last time I had such a visceral reaction to a piece of Indians news, it was upon learning about the Ubaldo Jimenez trade. The problem with being a fan first is that it makes one prone to that sort of off-the-cuff emotional reaction, whereas I’d much prefer to think for a while and then react. This is the more refined (albeit still tinted by the irrationality of fandom, poorly written and disjointed) version of that initial screed. I always liked Manny Acta as the Indians manager. I supported his hiring, and I generally thought that he did a good job as manager from what I could tell. Of course, some of the most important duties of the manager are the things that, as an outsider, I cannot quantify and really can’t even get a good feel for--how he relates to players, how well he works with the front office and how he interacts with them on roster decisions, and the like. It’s certainly possible that Manny Acta is bad at these aspects of the job. However, I reject the notion pushed by a contingent of Cleveland fans that Acta is a poor tactical manager from a sabermetric tactic. Again, this is an area that’s next to impossible to quantify--it's easy to pick some key categories on which managers have influence (like intentional walks, sacrifice hits, stolen base attempts, pitching changes, lineup construction) and mentally assign the manager a score based on rudimentary criteria (“intentional walks = bad”, “games led off by sub-.330 OBA hitters = bad”, etc. ), but it’s difficult to develop a comprehensive evaluation even on these limited criteria. This is all complicated by the fact that some of our sabermetric tools have a margin of error comparable to the theoretical payoffs of alternative strategies, and that the manager always is working with more information than we have regarding the factors that could cause players’ abilities to deviate from our estimate of their true talent. However, based on my general notion of baseball strategy and ability to process my observations, I have no overarching issues with the tactics employed by Manny Acta. Quite the opposite, in fact--I had less moments of confusion when watching Acta manage than I did with Mike Hargrove, Charlie Manuel, or Eric Wedge. Acta spoke intelligently about strategy in his media appearances and stayed true to his word as much as can be reasonably hoped for from a manager. Of course, any manager is going to make isolated decisions that are puzzling. If cherry-picking just a few of these instances is enough to call for the skipper’s head, then I can guarantee you that it won’t take much more than a week into his replacement’s regime for a similar emotion to emerge. If you have to point to one specific choice in reliever usage, or one marginal young player that didn’t play enough for your taste, then I humbly suggest you don’t have much of a case. No, it doesn’t make sense to me either that Acta chose to use Vinny Rottino as a leadoff hitter (in one game! ), but how many managers would have used Shin-Soo Choo as their leadoff hitters in over half of the team’s games? I’d suggest the latter is a much bigger deviation from the normal practice of managers, and one more amenable to sabermetric orthodoxy than the other is a departure. Of course, this is typical owner-speak and reading into it is pointless. Still, the quote strongly implies that Dolan believes the single individual most responsible for winning the World Series is the manager. If the Indians could just find the right manager, they’d be fine. Left unsaid is what those levers are. And those levels have never been pulled. Since Dolan bought the team, the Indians have hired and fired three full-time managers: Charlie Manuel, Eric Wedge, and Manny Acta. They have fired zero general managers: Shapiro was promoted to president and his lieutenant Chris Antonetti took over after the 2010 season. Manuel’s firing was a little different than those of Wedge and Acta--it came mid-season in the Indians first transition year between perennial contender and rebuilding. Manuel was not seen as a fit for the new paradigm, and so his attempt to force the issue by requesting an extension led to his dismissal. Shapiro displayed a tremendous amount of loyalty to Wedge. It would have been easy to fire him after the failed attempt at contention in 2006, or the letdown on 2008 on the heels of 2007’s near pennant. But Shapiro stood by Wedge until after 2009, when a team that fancied itself a contender crashed and burned to 65-97. The Indians’ fundamental problems, however, remain the same in 2012 when Acta was canned as they were in 2009 when Wedge was canned. The Indians possess a number of solid hitters at tough positions (Carlos Santana at catcher, Jason Kipnis at second, Asdrubal Cabrera at short), but gaping holes at the easiest positions (only Shin-Soo Choo was a good producer in the corners, and Travis Hafner’s perennial injuries have also held back the DHs). This is not a temporary problem--the Indians’ farm system has not produced a major league caliber 1B/LF since--Luke Scott? Sean Casey? The Indians of 2009 and 2012 were also both woefully short on starting pitching. In 2009, the team had just traded CC Sabathia and Cliff Lee, so it was somewhat understandable. In 2012, though, those departures could not be blamed. The Indians ventured into 2012 with a rotation consisting of one pitcher who’d both pitched well and had good peripherals in the prior season (Justin Masterson). They had an enigmatic pitcher acquired at the cost of the organization’s top two pitching prospects (Ubaldo Jimenez); a veteran coming off a lousy season in the NL (Derek Lowe); a finesse righty who was below average in 2011 despite a league-leading 1.1 W/9 (Josh Tomlin); and a sinkerballer with an unremarkable minor league track record (Jeanmar Gomez). The 2011 Indians started the season 30-15, which was a lot of fun at the time, even for those of us who suspected it was but a mirage. But those 45 games have ultimately proved to be a disaster for the franchise. They transformed what was supposed to be a rebuilding season into an increasingly desperate attempt to cling to the lead in the AL Central. They goaded the front office into trading its two best pitching prospects for Ubaldo Jimenez. And even after the team stumbled to 80-82, those 45 games influenced the team’s expectations heading into 2012: they were contenders. Regardless of intention, the Indians were either unwilling or unable to acquire additional talent to fill out the roster, and insisted that there was sufficient talent to contend, leaving Acta as the fall guy if the purported contender failed to contend. The Shapiro regime has controlled the Indians for eleven seasons, and in that time they have managed to make the playoffs just once while playing in one of MLB’s weaker divisions. Assuming that they should have a 20% chance of winning and seasons are independent, there’s a 26% chance that could happen by chance, so it’s not inherently damning. When I tweeted something to that effect (minus the binomial probability), I got a reply that simply said “Process != Results”. I was unfamiliar with the tweeter, so I’m not sure if it was serious or facetious. I’m inclined to think it’s the latter, as it sounds very much like the kind of sentiment that is often offered by what could be called the Cameron school of sabermetrics. There is of course a great deal of truth in the statement; a process can be valid and yet produce poor results through decisions made on the basis of incomplete information, unforeseen events, chance, and other factors. But that doesn’t mean that actual results can be ignored, particularly as the sample becomes larger. Of course, it’s easier to rationalize poor results when the process is in line with one’s ideological leanings (this is true for me as well, of course). It wasn’t long ago that Chris Antonetti was the darling of the organizational rankings crowd. * Shapiro’s Indians have drafted poorly. The most recent Indians first rounder to establish a solid major league career is Jeremy Guthrie (2002). The most recent to have one with the Indians is CC Sabathia (1998). The jury is still out on several recent picks, although if Alex White or Drew Pomeranz is productive, it will be with another organization. * The Indians have done a great job of trading for players either in the minors or very early in their major league careers. Cliff Lee, Grady Sizemore, Asdrubal Cabrera, Travis Hafner, Carlos Santana, Shin-Soo Choo, Michael Brantley, Chris Perez, Coco Crisp, and Justin Masterson are examples. But it’s much harder to find contributors drafted or signed by the Indians--Jhonny Peralta, Fausto Carmona, Jason Kipnis, Rafael Betancourt, Rafael Perez, Vinny Pestano? (Neither of these lists is comprehensive by any means, but I think thye are representative of the whole). I don’t think that questioning the efficacy of the current organization at developing talent based on an eleven year fallow is excessively “results-oriented”. With respect to the next managerial hire, I tend to think it won’t matter much. The organization will not win until it can develop more players, regardless of who is managing them. I’m hoping that Terry Francona’s interest is real and not simply a courtesy to Shapiro, but I doubt that is the case. While I don’t think Francona would be a silver bullet, his tenure in Boston doesn’t raise any obvious red flags. But Francona figures to be the default #1 candidate for any openings, and it’s difficult for me to believe that he would choose Cleveland over other options. Sandy Alomar appears to have the inside track otherwise, and there’s very little evidence as to what type of manager he would be. There is plenty of evidence that Indians fans will welcome him as 90s nostalgia grows more powerful, and while that may be a plus from a PR perspective, it can be obnoxious for someone who was never a particular fan of Alomar the player. And heaven forbid the fans start talking about Omar Vizquel.